<i>The biggest, most popular and cleanest lake of Italy…Lake Garda, also “ Lago di Garda”. It is the ideal destination for a relaxing holiday with your children. Green nature, impressive mountains, lovely villages, nice climate, lot of activities for the children and parents, but also the possibility to relax and enjoy the sun. All reasons why many families choose a holiday on Lake Garda, preferably on a campsite. For children camping is real fun! The whole day they can play outside with new (holiday) friends. Gustocamp made a list with the most child friendly campsites on Lake Garda. Therefore, you can be sure that during your holiday the children will enjoy themselves. Choose for a family holiday on Lake Garda! 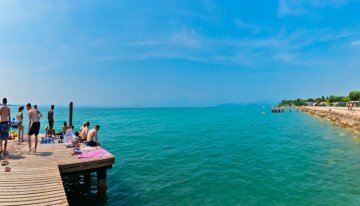 Which campsite on Lake Garda fits you? Which campsite at Lake Garda does meet the wishes of your family the best? Do you want to enjoy the sun, relax at the lake or visit the villages near de harbour? Make a choice for Villagio Eden, Campsite Cisano San Vito or Campsite Bella Italia. These campsites are near or right next to the lake and are close to a small village. 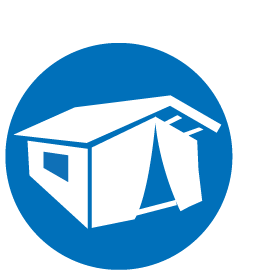 Do you want a smaller campsite, which is suitable for younger children? Then the best choice is Villagio Eden or Campeggio del Garda. Do you want to discover Lake Garda and at the same time visit cities like Verona or Milan? Alternatively, do you want to spend a day at an amusement park with your children? Then it is best to search for a campsite at the south side of the lake, such as Campeggio del Garda or Campsite Bella Italia. No matter which campsite you choose, a Gustocamp campsite is always a child friendly one. 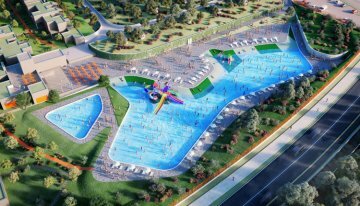 Campsites with multiple swimming pools, water slides, playgrounds en animation makes it a holiday where nobody gets bored, especially the children will have the time of their lives. Enjoy outdoor living, sleeping at a campsite in an accommodation, which is luxurious and comfortable. 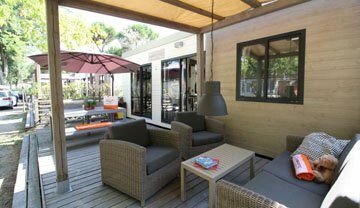 Choose from luxurious bungalow tents with kitchen and gazebo or a luxurious mobile home with lounge terrace. All tents and mobiles homes of Gustocamp are completely furnished for an unforgettable family holiday on Lake Garda. Going on a holiday with your baby? 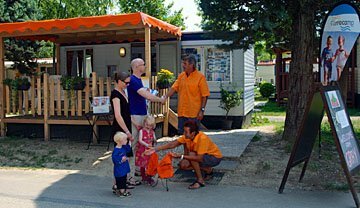 In our Mobile home Gusto Baby, you can camp luxuriously with all facilities for your baby and young children. It is equipped with a baby monitor, night light, bottle warmer, buggy, high chair and baby bath. All is included in the price and therefore nothing has to be taken from home and you can just enjoy a relaxing holiday. includes all the necessary safety features for your baby and young children, such as safety plug covers, corner protection, cupboard/door locks and a safety gate. All Gusto baby mobiles homes have air-conditioning and an extra broad and comfortable wooden deck area. This terrace has a special made child-corner with soft bottom and fixed roof. You can find this Gusto baby at campsite Bella Italia near the lake. Holiday means no restrictions and do want you want to do. Every family member experiences the holiday in a different way. Children will enjoy themselves with friends at the activities of the animation team; parents can relax in the sun or read a book with a nice cup of cappuccino. All campsites of Gustocamp on Lake Garda are offering a variety of activities and facilities for both children and adults, such as mini-club, teenage disco, coffee bars and restaurants. You can meet up at the swimming pool or at your comfortable mobile home or tent. Holiday means time for each other. Lake Garda is a fantastic destination to enjoy your holiday together with your family and friends. Go out with your family and discover the pearls and cities around the lake and beautiful region. The quickest way to discover all the lovely villages around Lake Garda is by boat, ferry or catamaran. These boats will bring you from one village to another on this mountain lake. A recommendation is to have a drink or ice cream at the car-free city Sirmione and enjoy the beautiful view on Lake Garda. In addition, the Roman ruins and castle Rocco Scaligera will also appeal to the whole family. The lovely and historical village of Bardolino is well known of its Bardolino wines. You can combine a wine tasting with the child friendly beach of Bardolino. The beach is very appropriate for young children, because it gradually slopes into the lake. Do you want to shop? Then you are at the right place in the lively harbour town of Peschiera del Garda or the promenade of Saló. At the north side of Lake Garda, near Torbole, it is always wind. It is a perfect location to sail, wind surf or kite surf. There are plenty of surf spots and surf schools in the villages of Brenzone, Malcesine and Riva del Garda. The bay of Torbole is ideal for novice surfers, because most of the time it is less windy in this bay. Not only above the water, but certainly under the water surface there is a lot to see and experience. If you like fishing or diving, this area is perfect. You can’t make the children happier when you decide to go one day to the amusement park Gardaland. It is the biggest amusement park of Italy with more than 50 different attractions for both young and older children. From exciting rollercoasters to splashing white water river rafting and shows. Verona is a nice city at a short distance of Lake Garda. The city of love, city of Romeo and Juliet. Verona is on the list of the UNESCO with its historical city centre. You enter Verona through the old city gate and then you are directly in Piazza Bra. In this big square, you will find the still used Roman amphitheatre. During the day, you can visit the arena and catacombs and in summertime, there are opera performances. Sit down at one of the terraces of the Piazzi dei Signori for a drink or something to eat. The children can play and run on this square, while mom and dad can relax and enjoy dinner. Casa di” Giulietta” Juliet: a 14th century house, where Juliet lived according to the stories. Nowadays it is almost a pilgrimage place for couples in love, who perform the famous declaration of love on the balcony. Don’t be surprised if people touch the right part of the bronze statue of Juliet, this would bring happiness in love. In a 10-minute ride on the cableway from the village Malcesine, you’re on the top of the 1800 meters high mountain Monte Baldo. From this top you do not only have the most beautiful view of the lake, but also on the top of the Alps, Po-plain and imposing Dolomites. In short: an awesome family day out. Gustocamp made a list with the most child friendly campsites on Lake Garda. In this case, you’re sure that everything is suitable for your children. Do you want personal advice? Call with one of our employees of the Gustocamp office. Monday until Friday reachable by telephone from 9.30 until 17.30 at telephone number +44 (0)1706438006 or send an e-mail to info@gustocamp.co.uk.